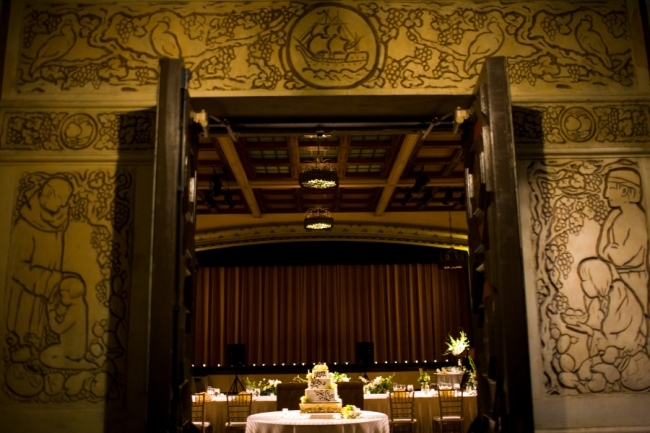 The Prado at Balboa Park is a popular San Diego wedding venue with classic Spanish architecture, fountains, colorful lighting, private courtyards and an elegant grand ballroom. If you’re interested in having a San Diego garden wedding, the Prado may appeal to you. There are five wedding event sites at the Prado – Grand Ballroom, Fountain Courtyard, Loggia, Alhambra and Casa Del Rey Moro Gardens. Loggia and Alhambra are smaller venues, Casa Del Rey Moro Gardens is the wedding ceremony site situated around a reflection pond and the Grand Ballroom is the big reception site. This old classy ballroom has high, hand-stenciled ceilings, wood floors and a small, second-floor window to shoot pictures from high above. The Prado and the surrounding area of Balboa Park has what most photographers love, good lighting, arches, water for reflections and pretty architecture. To see a photo gallery of a wedding ceremony photographed at the Prado, and a wedding reception held in the Grand Ballroom, view a wedding ceremony photographed at Casa Del Rey Moro Gardens. We honestly can’t thank you enough for the gorgeous wedding photos. We were so thrilled to have you as our wedding photographer. You were a dream to work with, flexible, enthusiastic and incredibly professional.